B. Vogel: Frantisek-Uhlir-Team im Raven. Von Teoder Auer k Trio projektu. Uhlir comes up with the interesting concept of having five bassists in the band for a unique structure. Outstanding critic Chris Parker writes about CD Maybe Later in May 2008. Bassist Frantisek Uhlir is probably best known in the UK for his work in pianist Emil Viklicky's trio, but on this album he leads a trio completed by Croatian guitarist Darko Jurkovic and drummer Jaromir Helesic. Over Uhlir's characteristically lithe and flexible, but sonorous bass, Jurkovic (like Stanley Jordan) concentrates on the 'hammering on' technique rather than the more conventional plucking or strumming, and the result is a fleet, neat guitar sound particularly well suited to the refreshingly straightahead approach the trio favours. In addition to compelling but sensitive visits to standards such as Hayman/Young's 'Love Letters' and Rodgers and Hart's 'I Married an Angel', there are seven in-band originals from either the bassist or guitarist, and the result is a thoroughly unpretentious but absorbing and wholly entertaining album packed with unfussy subtleties and unshowy felicities, at once thoughtful and brisk, robust and musicianly. I had rather more luck with pianist Emil Viklicky's trio concert at the Pillar Room. The Czech jazz scene has produced some fine players. Some such as bassists Miroslav Vitous and George Mraz plus keyboardist Jan Hammer have moved to the US and acquired international reputations. However, there are still some excellent players at home and it is surprising that the Czech scene is not better known especially given the success of Norwegian jazz in recent years. Perhaps the Czech musicians for all their ability are still too much in thrall to the American model. It must be said that the Norwegians have developed an entire sub genre of their own. I first encountered Viklicky's playing on a visit to Prague in 1994. I have admired his work ever since and saw him guesting with British trumpeter Eddie Southern at Brecon a few years ago. However the chance seeing him with his regular trio here at Cheltenham was too good an opportunity to miss. He is certainly the best known of the home based musicians and internationally the news is beginning to spread about just how good this trio is. They opened with "Father's Blues" an adaptation of Horace Silver's "Song For My Father". This incorporated the first of several stunning bowed bass solos from Frantisek Uhlir and the sizzling cymbals of drummer Laco Tropp. Viklicky was born in the town of Olomouc in the province of Moravia and the adaptation of Moravian folk tunes as vehicles for jazz improvisation is the hallmark of the trio. Viklicky's entertaining announcements gave rough English translations of the original Czech titles. Thus we heard "A Little Bird Flew By" followed by "Highlands, Lowlands" the melody of which was also borrowed by Janacek. Indeed Viklicky has been described as "the Janacek of Jazz", a title he seems quite happy with. This latter tune included a solo from Laco Tropp that was remarkable in its melodic construction. The beautiful ballad "Love, Dear Love" was followed by a rollicking version of Duke Ellington's "Cottontail" with a rousing solo from Viklicky who for all his tenderness on ballads can really cut loose when he gets the chance. Besides his mastery of his native folk music Viklicky has a complete grasp of all the idioms of American jazz and blues plus a thorough grounding in the classical tradition. He really is a talented all round pianist and like Cowley and Lapthorn before him plays with great physicality when he lets rip. This tune also offered the brilliant Tropp another chance to show his chops. He is a consummate timekeeper and an excellent soloist. "Song For Jane", a composition by Uhlir was a set piece for the bassist's skills with the bow. His deep rich tone is as smooth as velvet and his playing a study of controlled emotion. This haunting piece is a genuine stand out number. The folk melody "Desire" saw him demonstrate the supple pizzicato style that had been a factor throughout the set. This man is a world-class player in the tradition of great Czech bassists. He deserves to be ranked up there with Mraz and Vitous. Finally came another Moravian tune a paean to drinking entitled "Vinko,Vinko" or "Wine, Oh Wine". This playful and joyous romp saw the band really enjoying themselves and the audience loving it too. They went down a storm and must have sold a lot of copies of their live album. This was yet another highlight and now the link has been established let's hope we see more Czech musicians next year. Weiden. Alle waren sich einig: Konzertbesucher, Initiatoren und Publikum äußerten sich begeistert über die neuem Räumlichkeiten das Jazz-Zirkels in "Steger's". Dicht gedrängt saßen die Musik-Liebhaber um die kleine Bühne, und es herrschte typische Jazzkeller-Atmosphäre. Mit seinem alten Backsteingewölbe und den weiß getünchten Steinwänden erinnert die Örtlichkeit an einen Loft in New York. 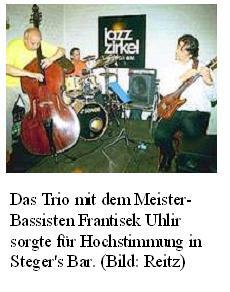 Das Trio mit dem Meister-Bassisten Frantisek Uhlir sorgte für Hochstimmung in Steger's Bar. (Bild: Reitz) Nur ein paar Scheinwerfer, eine Wandtafel mit dem Emblem des Jazz-Zirkels, sowie ein altes Klavier in der Ecke lassen vermuten, dass es sich hier um eine "Klangwerkstatt" handelt, einen Ort, wo neue Klänge und Ideen entwickelt und vorgestellt werden. Auf der Bühne steht Frantisek Uhlir, Urgestein der Weidener Jazz-Szene, am Kontrabass. Seit Jahrzehnten zählt er zu den Stammgästen beim Jazz-Zirkel. Er ist prädestiniert, die neue Ära im neuen Domizil einzuläuten. Fest im Mainstream des Modern Jazz ist das Programm des Trios verwurzelt. Es erklingen Standards, die von ausdrucksvollen Balladen bis zu nervösen Bebop-Klängen reichen, garniert durch einige Eigenkompositionen, die aber fest in der Tradition wurzeln. Der kroatische Gitarrist Darko Jurkovic ist eine musikalische Sensation: Er ist einer der wenigen Vertreter des "Two Hands Tapping", einer Spieltechnik, die eher an einen Pianisten erinnert. Hier entsteht der Ton ohne Anschlag der Saiten, beide Hände sind am Griffbrett. Während die linke Hand Akkorde und Basslinien spielt, wird mit der rechten Hand die Melodie gespielt. Das alles geschieht in einem rasend schnellen Tempo, und bei geschlossenen Augen vermutet man zwei Gitarristen auf der Bühne. Zwar konnte man diese Technik schon gelegentlich im Fernsehen mit ihrem amerikanischen "Erfinder" Stanley Jordan bestaunen, aber so hautnah hatte man diese außergewöhnliche Spielweise noch nie erlebt, denn sie hat bisher kaum Nachahmer gefunden. Frantisek Uhlir gilt als eins der ganz großen europäischen Talente auf dem Kontrabass. Unter seinen Fingern singen die Saiten. Er prägt den Sound des Trios, übernimmt aber auch Melodie und Thema und zeichnet sich in den hohen Lagen durch perfekte Intonation aus. Zu den Höhepunkten eines Auftritts gehört es, wenn er zum Bogen greift und eine Ballade intoniert, die unter die Haut geht. Schlagzeuger Jaromir Helesic zählt zu den gefragtesten Musikern der Prager Jazzszene. Bekannt wurde er durch sein Zusammenspiel mit Ludek Hulan. Man findet seinen Namen bei Gruppen vom Rockjazz bis zur Bigband. Er agiert musikalisch und ordnet sich dem Gruppenkonzept unter, im Solo zeigt er sich als dynamischer, expressiver Künstler. Ein gelungener Start ins nächste Jahrzehnt beim Jazz-Zirkel! Slyšet, ale hlavne videt, hrát takového kytaristu, jakým je chorvatský kytarista Darko Jurkovic u nás, ani ve svete, není mnoho. Používá totiž stejné kytarové techniky jako jeho slavnejší kolega Stanley Jordan, totiž techniku "two hands", což znamená hraní na hmatníku nástroje obema rukama soucasne. Pripomíná to hru na klavír. Touto technikou ve svete hraje málo muzikantu, údajne i v oblasti rockové muziky tak nekdo hraje. To ovšem zdaleka není to hlavní, proc poslouchat CD tria Jurkovic-Uhlír-Helešic LIVE 2002. Na uvedeném albu, které si muzikanti vydali vlastním nákladem, najdeme skladby Jurkovicovy, Uhlírovy, ale i písnicky prevzaté. Spojení techto trí skvelých muzikantu bylo více než štastné a hlavne prínosné pro ne samotné, tak i pro nás, posluchace. Album nebylo jen nejakým jam seession nahraným žive v Železné, ale bylo provereno dlouhou koncertní šnurou, kterou trio absolvovalo u nás i v zahranicí a bylo vždy doprovázeno zaslouženými ohlasy z rad publika i odborníku. Na jejich hre byl znát obrovský vývoj a pokrok v celkové souhre tria, což mohou doložit posluchaci v naší republice, napr. v Pardubicích, Slaném a i jinde. Darko Jurkovic je nesmírne invencní kytarista a jeho neobvyklá technika mu umožnuje daleko lepší využití kytary jako nástroje. Zapojení obou rukou do hry prináší s sebou další možnosti technického rozšírení kytarové hry. A pokud se k tomu pridá i výtecná invence, jako tomu v prípade Jurkovice skutecne je, o dobrý výsledek je postaráno. Tím nikterak nechci snižovat výkony dalších clenu tria, jak Františka Uhlíre, tak i bubeníka Jaromíra Helešice. To, že František Uhlír patrí k ceské kontrabasové špicce je zbytecné psát. Navíc jeho kontrabas je vždy naprosto technicky skvelý, s krásným dlouhým tónem a dobrou reprodukcí, sluchu posluchacu ladící. Jeho hra má obrovský tah a jeho vedení basové linky je moderní i používáním stylu hry smyccem ci hraní dvojhmatu nebo dokonce akordu na nástroj. Potrebný drive triu dodává bubeník Jaromír Helešic. Ten sice nemá na CD tolik možností jako Jurkovic a Uhlír, ale i jeho hra je pružná a zcela ji podrizuje potrebám daných skladeb k celkovému vyznení tak, aby výsledkem byl naprosto kompaktní celek. Poslouchat CD Live 2002 je opravdu radost i proto, že skladby muzikantu si v nicem nezadají s doplnujícími evergreeny. Navíc pro toho, kdo mel možnost se i vizuálne dívat na kytaristu, používajícího tento ne príliš užívaný zpusob hry,je zážitek dvojnásobný. The Czech Frantisek Uhlir is one of the greatest bassists in the world. He works frequently in the trio of his countryman pianist Emil Viklicky, another great European player about whom most Americans know little. I just ran across a brief note I made when I was in Prague twelve years ago, helping American economists teach market economics to Czech journalists newly released from communism. June 10, 1993: Went to Agartha last night to hear Frantisek Uhlir, the wonderful bassist. Earlier in the day one of his fans told me he is better than George Mraz. Maybe, maybe not, but he is superb, world class. Uhlir is a short, powerful, chubby man with a pleasant round face. His tone is round, too, and centered, and he is fast, agile and swinging. One of the best contemporary pianists, Viklicky's soloing and comping, his touch, voicings and intervals have a good deal in common with fleet, tasteful pianists like Tommy Flanagan, Jimmy Rowles and Bill Charlap. His individuality is deeply informed by the music of his native land, and particularly by that of Moravia. To read the review of both albums, go here. With the possible exception of guest trumpeter Dusko Goykovich, chances are you've not heard(or even heard of) these gentlemen before-and if that is indeed true, as I suspect it is,perhaps it's time you were introduced. Frantisek Uhlir, who leads this excellent trio, is a truly phenomenal bassist, and his colleagues-guitarist Darko Jurkovic and drummer Jaromir Helesic-are no less accomplished. Any time a jazz group is introduced to concert-goers by the president-not of the local musicians' union, but of the country-there can be little doubt that it has something special to offer. The trio has the first half of the concert to itself, and plays marvelously on a pair of original compositions by Uhlir ("June in Prague," "From Heart to Hearts") and two more by Jurkovic ("Fly Time," "Banana Split"). The breezy "Fly Time" is especially delightful, soaring easily skyward behind nimble solos by all hands. Durkovic, who embodies the trio's melodic nature, brings to mind Herb Ellis, Barney Kessel or Tal Farlow, Uhlir the late NH?P or Ray Brown, while Helesic could easily be mistaken for Roy Haynes, Jeff Hamilton or Ed Thigpen. Everyone swings buoyantly on "Prague" and "Split" before slowing the tempo on "Hearts," whose opening passage is embellished by Uhlir's gently bowed bass. Goykovich joins the trio for the last four numbers, and what was already a memorable concert becomes even more so, as the veteran trumpeter is absolutely awesome on "Secret Love," Antonio Carlos Jobim's "How Insensitive," Dizzy Gillespie's "Ow!" and another standard, "I'll Close My Eyes." There's no letdown by the trio, which lends Goykovich unwavering support as its members craft admirable solos on every number. Goykovich, who has performed with world-class musicians and groups all over the world and logged time in bands led by Maynard Ferguson and Woody Herman, not to mention France's legendary Clarke-Boland band, has a clean, lyrical style that for purposes of comparison may be likened to that of Bobby Shew, Marvin Stamm, Joe Wilder or the late Blue Mitchell, among others. Here he's as cool, confident and creative as ever, whether playing open, as on the first three numbers, or muted on "I'll Close My Eyes. Thanks to the trio's expertise, and its dexterous interplay with Goykovich, the Prague concert is impressive from start to finish, an opinion that is reinforced by the album's first-rate sound and generous playing time. I am left with only one more thing to say-I wish I'd been there. 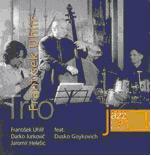 Visit Frantisek Uhlir Trio on the web. Fly Time; June in Prague; Banana Split; From Heart to Hearts; Secret Love; How Insensitive; Ow! ; I'll Close My Eye (64:01). Dusko Goykovich (6-9): trumpet, flugelhorn. Es kommt nicht alle Tage vor, dass ein leibhaftiger Staatspräsident eine Jazzband ankündigt. So geschehen auf der Prager Burg im Februar dieses Jahres. Im Rahmen der regelmäßig stattfindenden Jazz-Reihe trat das Frantisek Uhlir Trio auf, gestärkt vom jazzbegeisterten Präsidenten Vaclav Klaus. Das Uhlir Trio - der jüngst erschienene Live-Mitschnitt beweist es - besticht durch kreativen Mainstream, der auch schon mal, vor allem, wenn Gast Dusko Goykovich zur Trompete greift, in rasanten Bebop münden kann. Auf den meist rhythmisches Fundament, gestützt von Schlagzeuger Jaromir Helesic. So kann Gitarrist Darko Jurkovic solistisch glänzen. Die Saiten werden nicht gezupft, sondern geklopft oder beidhändig berührt. Ein Musterbeispiel bestechender Tap-Technik. Melodie und Akkorde sind in fließende Swing-Ströme eingebunden. Hierfür nimmt Bandleader Uhlir immer wieder die Rolle des Begleiters ein. Sein souveränes Spiel von schnörkelloser Präsenz, ist auf Ego-Trips nicht angewiesen. Dank seines virtuosen Pizzicato-Stils, seiner imponierenden Bogen-Kunst und seiner kräftigen Walking-Bass-Linien muss Uhlir zu den besten Bassisten Europas gezählt werden. Záznam koncertu porádaného Správou Pražského hradu, který zaznamenal Ceský rozhlas Praha v únoru letošního roku, je jedním z dalších koncetního cyklu Jazz na Hrade. Trio Uhlír - Jurkovic - Helešic a jejich host, skvelý trumpetista Dusko Goykovich, pripravili posluchacum v sále, i nám doma, skvelou hodinku dobré pohody. Prvních ctyri skladby hraje pouze zmínené trio a teprve na poslední ctyri prizvali svetoznámého trumpetistu. Skladba druhá a ctvrtá je z autorské dílny Darko Jurkovice, František Uhlír je podepsán pod titulem tretím a pátým. S Dusko Goykovichem hrají skladby pouze prevzaté. Hnacím motorem tria je Uhlíruv nádherne znelý a "dlouhý" kontrabas. Skvelé vedení basové linky mu usnadnuje vytríbená technika hry a to i arco. Dokladem toho muže být napríklad Uhlírova balada From Heart To Hearts. Pri každém ozvláštnení harmonie Uhlíruv kontrabas reaguje velice citlive a vždy tak, že vytvárí ono patricné napetí s následným rozvedením tak, aby se posluchac ani na vterinu nenudil. Chorvatský kytarista Darko Jurkovic patrí k tem nekolika málo kytaristum, kterí na nástroj hrají technikou "two hands", hraní na hmatníku kytary obema rukama soucasne, podobne jako se hraje na klavír. Stejnou techniku používá napr. i jeho slavnejší kolega Stanley Jordan. Pri koncertech tria dochází tak k paradoxu, že je nejen co poslouchat, ale je i na co se dívat. Darkova nesmírne invencní hra a neobvyklá technika hry mu dovoluje daleko lepší využití možností nástroje. Poslouchat, a prímo se dívat na jeho styl, je opravdu zážitek. Tretí clen tria, Jaromír Helešic, drží oteže celého tria pevne v rukou a vždy, podle potreby, okamžite reaguje na spoluhráce a vytvárí onen povestný základ, který jede, ale nestrhává pozornost posluchacu na sebe. Jeho hra je velice pružná a prizpusobivá. Dusko Gojkovich, rodák z Cerné Hory, je excelentním trumpetistou, který se prosadil mezi svetovými muzikanty, mimo jiné i tím, že proslul jako clen trumpetových sekcí celé rady svetoznámých kapel, od Maynarda Fergusona až po Woody Hermana, nebo Big Band Kenny Clarka & Francy Bolanda. V soucasné dobe vystupuje prevážne jako sólový hrác. S triem si zahrál nejprve slavný evergreen Secret Love, a i když tato skladba byla nahrána ve stovkách, možná tisících, aranžmá, presto není jen obehráváním známého tématu. Jeho kultivovaný tón a obrovská technika hry musí každého okamžite zaujmout. Jeho sóla mají patricnou výstavbu a správnou gradaci. Skvelá a lehounce odpíchnutá Jobimova How Insensitive predchází dalšímu evergreenu, skladbe Ow!, legendárního trumpetisty Dizzy Gillespieho, ve které Gojkovich posluchace presvedcí nejen svým celkovým výbušným pojetím. Nahrávka je zároven i jednoduchým dukazem toho, že vlastne hrát se dá všechno, a záleží pouze na prístupu interpretu, zda obycejné téma povýší na umelecký zážitek. Celkový dojem ze hry tria a slavného trumpetisty je velice pozitivní. Všichni ctyri pusobí jako kompaktní celek a je dobré, že k takovému spojení došlo a bylo i zaznamenáno. Jazzoví príznivci, kterí sledují hru samotného tria už od roku 2002, kdy vydali svoje první CD Live, musí konstatovat, že jejich hra je jako víno. Cím déle spolu hrají, tím jsou lepší. Spojení techto trí jazzmanu je štastné a prínosné nejen pro posluchace. Jejich spolecné muzicírování bylo provereno celou radou koncertních šnur u nás, i v zahranicí, s príznivými ohlasy. Milovníci jazzu, kterí i v naší republice meli šanci trio slyšet, jejich kvality jiste potvrdí.